Well, I haven’t given into temptations YET with all the online fabric stores’ sales & coupons. But I have been checking out the local crafting supplies stores, stocking up on notions and what-nots. 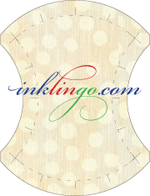 1) The mesh transfer sheet – handy for transferring quilting patterns without cutting out template sheets. 2) Bias Tape Maker – you need one for each size! 3) Gauge – which came in very useful when I had to fold over 1/8 seams in my last project. But this gauge is in metric, so I had to measure it against my other imperial rulers first. 4) Water soluble marker – gosh, this works like a charm for me! Why I didn’t get this much earlier is beyond me. LOVE IT! The marks wash out beautifully and most importantly, the marking is much more accurate and clear. 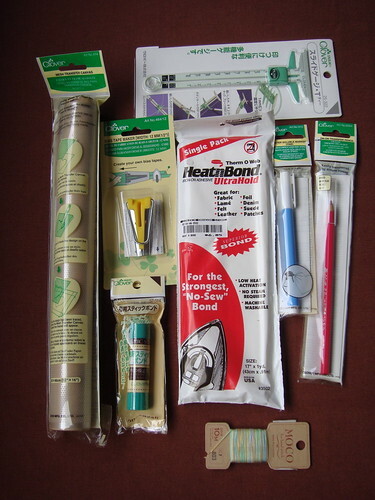 8) Heat & Bond No Sew fusible web – I was thinking of making some ‘iron-ons’ for friends who don’t sew. This is perfect for such ‘painless’ projects. I do consider myself somewhat of a ‘gadget-girl’ (I love gadgets, but I don’t go queueing up for iPhones just to be the first ones to get it…), and perhaps that explains why I fell in love with sewing again, after all these years. All the toys that you can buy for just marking patterns! For cutting fabrics! And once, I spent an entire day just search and surfing for various presser feets and their functions… And of course, the Internet has also made researching much easier and interesting, bringing me all the inspiring blogs of people who share their love & passion for their crafts. It seems your are about to make new experiences whith fabrics ? But may be I am wrong. Hi Yvette, just wondering where in Chinatown the store where you got all these notions is? I’ve been in Singapore for nearly a year now and the only places I knowing for quilting stuff is Quilts and Calicos at Tanglin and Spotlight! Any other suggestions? Hi Alexis, hope you will return to read this because I could not find your email or contact link on your blog. 2) Notions/ribbons shop at quite good prices: Sin Hin Chuan Kee http://www.shck.com.sg/ This shop is at the start of the same street at Quilts N Sew Forth. 511, Guillemard Road No. 03-07 S'pore 399849 Give her a call at 6743 8177 – she is the sweetest lady around – patient and really really nice!